As with Tesla’s Letters, I’m happy to report that Medicine, Man is now available on Kindle and that a free excerpt is also available via the new Kindle web browser app which lets you buy and read Kindle books without needing to own a real Kindle. Great idea from amazon. 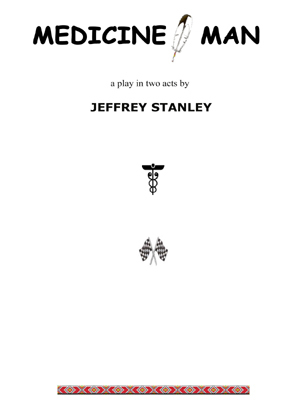 An excerpt of the play was also published in the ep;phany literary journal in 2003, which you can also read for free. A word to the wise — do not buy a hard copy of this script on amazon.com or barnesandnoble.com from the scammers trying to resell it for tens or hundreds of dollars. Be sure you’re buying a hard copy directly from barnesandnoble.com for $6.75, or the Kindle version for $7.13, or a hard copy directly from amazon.com for $7.50, or the amazon.co.uk Kindle version for a similar amount in Euros.